See what others are saying about their stay. Reviewer: Joseph B. from Lexington, KY.
We had no complaints during our one week stay at Elk Springs, everything was just like was pictured on the web site, and we were pleasantly surprised when we arrived. They were very easy to find and we found navigation around the region was easy, as long as you stay close to the main roads. We were visiting from Lexington KY. It was our annual family end of summer vacation get away just before school starts. We recently had moved to the region from Wisconsin, and wanted to find a place similar to the wooded nature scenes of northern WI, and this was it. 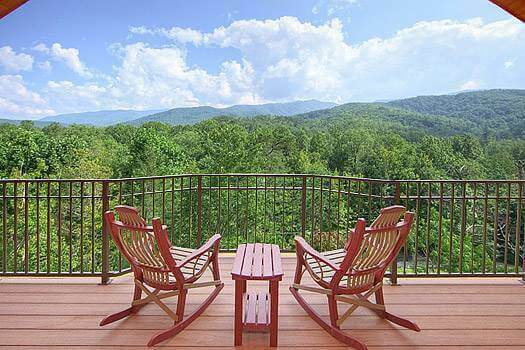 These cabins were private enough to enjoy quite relaxation on the deck grilling or in the hot tub looking up at the clear country sky, but located just close enough to be easy access to both Pigeon Forge and Gatlinburg. Our only advice to future guests would be that if you want to be completely secluded, we would recommend another cabin farther back on the loop. Since the Fontana is the first cabin located on the loop, you can see and hear the access road from the back of the deck. This is not a problem at all as there wasn’t much traffic, but further back in the resort you would be hard pressed to know there was anyone else around you. Our other advice would be to come during the week if you can. We hardly had to wait for anything from Monday to Friday, but as we were getting ready to leave Saturday, we saw droves of people coming to the area. Definitely a place to hit during the week if you can. These cabins are top of the line, and they come fully equipped with everything you will need for your stay. Dishes, glasses, bowls, basic cookware, even a corkscrew for your wine bottle. Ours even had an in cabin stacked washer and dryer to help clean those dirty cloths after a good long hike through the mountains. We took the Cherokee Loop motor trail through the park and saw some wonderful short hikes and scenic lookout points. We also stopped along the way to hike out to Grotto Falls, which was amazing and not that difficult of a hike. The next day we went the other direction in the park and hiked to the Laurel Falls. Our favorite part of the time was just relaxing in the outdoor hot tub with a nice bottle of wine and the stars after the kiddo went to bed. The upstairs loft was perfect for our child, and he quickly made it his own person wilderness fort! We loved our time, and will definitely be back this fall and for many years to come. Next time we come, we would like to try another cabin in the same region, we drove around the circle and scoped out ones we might like to come back to with the entire family. Thanks Elk Springs Resort, we can’t wait to come back! We stayed Sunday through Thursday morning during March for ourfirst first visit to the area. We visited the Gatlinburg area because my girlfriend and I were looking for a place to go during spring break. She had heard that there was a great variety of things to do in Gatlinburg, TN including the famous Smoky Mountains! We thought it would be a nice getaway and something different than the typical Panama spring break like all college kids do. My girlfriend and I were looking online for places to stay around Gatlinburg and Elk Springs Resort might have been the first thing we saw when searching Google. Prices looked good and the quality of the cabins and condos looked outstanding! It seemed like a no-brainer for us! I loved how everything was so new and tasteful! Everything was kept so clean and any utensil needed for cooking was provied along with dishwasher and laundry detergent. We had so many great and special experiences during our stay! Hiking was incredible, Ripley’s Aquarium was the best aquarium I’ve ever been to, we made a nice dinner on night, went to the wax museum and so much more! There are an infinite number of things to do in Pigeon Forge and Gatlinburg! Hiking was probably my favorite part because I love the outdoors and the scenery is something you might only witness once in a lifetime! The mountains are absolutely breathtaking! I would like to try more hiking trails next time I go and ideally go in the summer instead of March when it’s still rather cold. Stay at Elk Springs Resort, you won’t regret it! When my wife and I we thinking of places to go on our honeymoon the Smoky Mountains were the first thing that came to my mind. She always wanted to stay in a cabin in the mountains. This was my wife’s first trip to Gatlinburg but not mine. After searching for cabins we found Elk Springs Resort. We decided to stay in the Whispering Creek Cabin, which was actually off the resorts main property. It was easy to find and had a nice view of the Smoky Mountains. The cabin was perfect. Whispering Creek had a very nice sitting/eating area on the main floor. All the required dishes and appliances were provided for cooking a great meal. Downstairs was the bedroom with a pool table, which I was excited about and balcony with a hot tub that was used every night. I wish we had a hot tub at home so I could relax each day after work. The cabin also came equipped with wireless high speed internet which was nice so we could stay in touch with family through Facebook. We planned to just relax on the honeymoon so one day we took a drive through the Smoky Mountains. A drive through the Newfound Gap, which at the middle point lets you stand in Tennessee and North Carolina at the same time was a nice relaxing day. From there we drove to Clingmans Dome which is one of the highest points you can go in the Smoky Mountains. Beware though there is a hike to the top of about half a mile that is steep. After our drive and walk to Clingmans Dome we decided to go horseback riding. We found Sugarland riding Stables inside the park and had an excellent time. Definitely recommend them for a great time. Another day we decided to go to downtown Gatlinburg to see the ‘Cars of the Stars’ and the Ripleys Aquarium. The aquarium was the best part of Gatlinburg. We spent about 3 hours there looking at all the different things. We did miss out on some things we would of liked to do. Reviewer: Steven and Rhonda from Florence, MS.
My husband and I spent six nights in Unforgettable for our honeymoon in June of 2012. There are simply not enough superlatives to communicate how perfect this entire experience was. 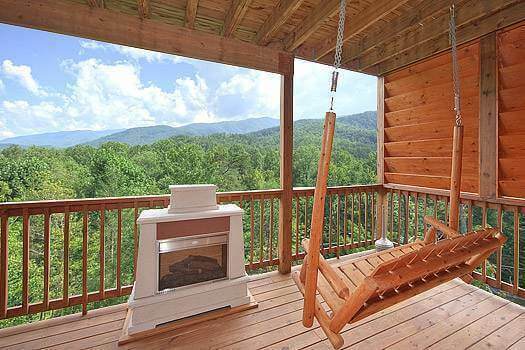 The cabin in Gatlinburg is aptly named. I cannot imagine any human being spending time there and then later being able to forget it! This summer was our first chance to stay at Elk Springs, but it certainly will not be our last! We both knew we wanted to honeymoon in the Smokies, so I did some pretty extensive online research. 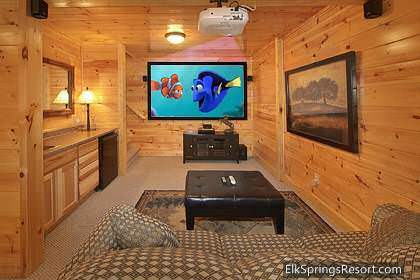 On TripAdvisor, there was absolutely no doubt that Elk Springs Resort had the highest ratings of any rental cabins in the area, so I started looking at the Elk Springs site to see if a cabin had the right ‘fit’ for us. Even the pictures of Unforgettable took our breath away. I was a little worried that the cabin might not live up to our expectations because they started out really high. Needless fears!!! The cabin was better than advertised! The amenities are unbelievable. We had a blast with the 3D television. We were amazed that the resort actually had a selection of DVDs for our convenience. The cabin has two levels; guests come in on the top level. The living room, pool table, kitchen, and table are on this level. The bedroom takes up the bottom level. A small laundry room with a stack washer/dryer is on this level as well. There are bathrooms on each level. Another awesome thing about the cabin is the fact that there are decks on each level! We often poured cereal in the mornings and went to eat it in the chairs out on the upper deck. The lower deck has a sauna (that it was too hot to use) and a spa (which we thoroughly enjoyed). My absolute favorite thing about this cabin was the shower in the master suite. It is huge with shower heads as well as side jets. We had seen pictures of it on the website, but we had no idea from the pictures just how big it was going to be! My husband really loved the pool table. He talked me into playing once, but I was so bad at it, he didn’t ask again. During our trip we did several fun things. We shopped and went to some of the attractions, but we did nature things as well. Two outings that stand out in my memory are hiking to Abram’s Falls and climbing to the top of Clingman’s Dome. The climb up to the dome is not for the faint of heart, but if the sky is clear, the views are incomparable! One of my favorite things about the Smokies is the fact that there is so much ‘homemade’ food stuff available! We bought fruit butters for family members (and ourselves). My mother even asked for some stone ground corn meal, and I wasn’t sure I could pull that one off, but we did find it-actually in the gift shop at Clingman’s Dome! Another experience that we highly recommend is a day trip to Asheville. Neither of us had ever toured Biltmore, so we made a trip over to Asheville one morning and toured the home. It is an easy day trip and one well worth the time if you have it! We know we will probably spend many anniversaries in Unforgettable in the future, and I cannot wait to get back there! The worst part of the trip was packing up to come home! Loved The View cabin for our Honeymoon! We are newlyweds and heard about Elk Springs Resort through a promotion and then decided to look into it further. Although we were unable to use the promotion because it was not valid for the days we would be staying there, we decided it was too beautiful a place to pass up. After reviewing cabins and options on the website, we decided to stay in ‘The View’. 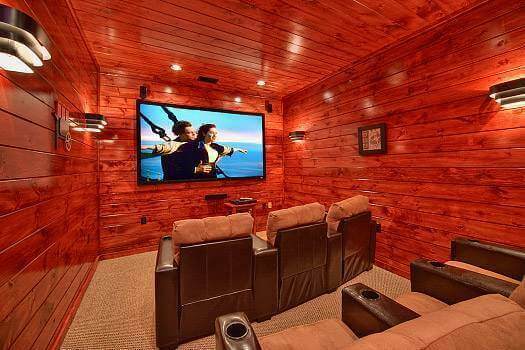 Since my husband is a movie buff, the home theater room and view are what sold us on this cabin. Our arrival was on Monday and our departure was Thursday during the middle of September? not NEARLY long enough! This was our first trip to Gatlinburg and we couldn’t have asked for a better honeymoon stay! Our cabin was a little more secluded than some of the others. I do have to say that upon entering the resort the cabins closest to the entrance seemed to be right on top of each other so we were a little worried about how ‘secluded’ our cabin would actually be. Luckily, we were further into the resort in a cul-de-sac with only three other cabins. The two cabins on either side of us were not super close and one of them was unoccupied so privacy wasn’t an issue. The cabin was BEAUTIFUL! There was plenty of space, a comfortable bed, great view, two indoor Jacuzzi tubs, outdoor hot tub, home theater room, and washer and dryer. We loved the outdoor hot tub and used it every night we were there, the indoor Jacuzzis were not as enjoyable because they took FOREVER to fill and the water only got to a warm temperature. 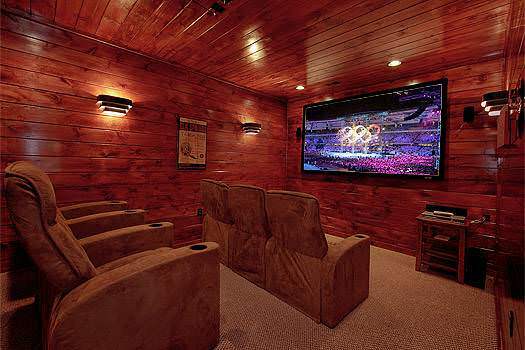 The home theater was also very nice, we just wished there was a way to hookup a Blu-ray player or USB drive to watch from these methods. They also provide a BASIC set of pots and pans, Tupperware, plates, bowls, glasses, etc. They even provide a corkscrew (I only mention this because we bought one at Mountain Valley Winery thinking we wouldn’t have anything to open the wine we just bought). I noticed the two ‘non-stick’ skillets that were provided were no longer ‘non-stick’ and should probably be replaced but if you don’t plan on cooking much in the cabin this won?t be a big deal. Our main priority on our honeymoon was to relax! We booked in-cabin massages with Quiet Reflections Spa who did a wonderful job, very professional and courteous and by far the most enjoyable part of our stay. I am into photography so we made sure to stop and the many lookouts to take photos of the mountains and streams. We made sure to walk the ‘strip’ of Gatlinburg where we had a wooden sign made with our family name. Somehow, we managed to avoid eating the ‘fair food’ (deep fried Oreos, funnel cakes, etc.) offered at many locations even though it smelled so delicious! Our other trip was to the Tanger Outlet in Sevierville to do some shopping. I was looking forward to updating my wardrobe after dropping all the weight for our wedding. My husband also stopped at Knife Works, which was much bigger than we had anticipated; give yourself plenty of time if you visit this store because there are so many things to look at. On our way back from Tanger outlet we stopped at the Hollywood Wax Museum and got plenty of amusing pictures to look back on! All-in-all we thoroughly enjoyed our stay and Elks Springs Resort is a great place to stay! For those planning visits in the future, try to plan more than just a few days because our trip just seemed to go way too fast and we were wishing we could stay longer! Managers Note: After your stay we adjusted the hot water heater to provide hotter water. We also replenish kitchen items frequently and do stock them. Should you have an issue such as you did with the pots and pans, please call us as we have supplies and staff on site and usually respond within 15 minutes. My family stayed at Secluded Hideaway for 2 nights on the week-end of July 20-22, 2012. This was our first stay with Elk Springs Resort. I initially found out about Elk Springs through a Groupon advertisement, and after checking out their website, I was intrigued by the beauty of their cabins. It has become a family tradition for us to celebrate my husband’s birthday with our two children and their spouses. We usually go to Kentucky Lake in Grand Rivers, KY, but decided to try something different this year. When I booked the reservations, it was important to me to get three separate bedrooms with three king-sized beds. I also wanted a cabin that was centrally located between Pigeon Forge and Gatlinburg. Secluded Hideaway offered both of these amenities. The game room downstairs was an added bonus since my husband, son, and son-in-law love to play ping-pong! Our cabin was very spacious and clean. One of our favorite things about Secluded Hideaway was the wraparound porch. We spend a lot of our time out on the porch visiting. The name Secluded Hideaway is a perfect name because you are indeed secluded. It was a very quiet and peaceful location, but very convenient to both Pigeon Forge and Gatlinburg. We rode the sky lift in Gatlinburg and ate at the Smokey Mountain Brewery for lunch on Saturday, and then drove to the Tanger Outlet Malls in Pigeon Forge and shopped for a while before heading to the Old Mill Restaurant for Sat. night dinner. We had not eaten at either one of these restaurants, and found them to be great choices! Even though we had a great time doing this outing, we found ourselves looking forward to getting back to our Secluded Hideaway for rest and relaxation! We celebrated my husband’s birthday after returning to our cabin by having a ping-pong tournament in the game room of the downstairs of our cabin. There was also a card table in the game room which we enjoyed very much as we played cards well into the night. The only advice that I have for future visitors is to make sure you figure out the short cuts that you can take to and from Gatlinburg and Pigeon Forge. Traffic was horrible on the strip between the two towns, but a local guy told us about a short cut we could take. All in all, we had a good experience with Elk Springs Resort and would definitely consider returning for a future visit. We arrived at our Gatlinburg cabin and stayed the first week of July. So our entire visit was about 7 seven days. This was our first visit to any cabin, including Elk Spring Resorts. We stayed at Elk Spring Resorts for a special occasion. It was our honeymoon! 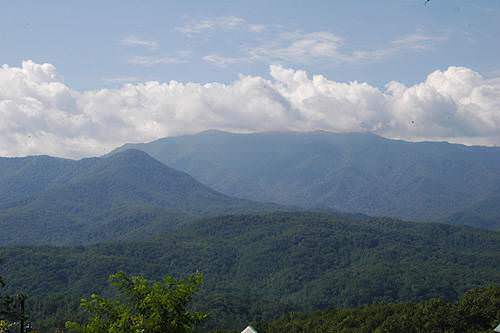 We chose Gatlinburg because we have always been told how beautiful it is, and because it was recommended by a friend of mine. One of my friends had recently gotten married and her and her husband decided to have their honeymoon at an Elk Springs Resort cabin. She had posted some pictures on her Facebook account, and talked about how they had such a great time, so I asked her where she had stayed. She told me and I looked up more information online. We love everything about the cabin! One of the first ‘pluses’ about the cabin was the fact that there were two bathrooms! I also liked the fact that the cabin was fully stocked with linens, towels, cooking utensils, toilet paper, dish soap, lighters; anything extra that we might need the cabin already had. We loved the hot tub and the jacuzzi tub. It was too warm for the sauna (being that it was July) but if it was winter time it would have been perfect! The bed was something that we loved. We were actually going to check to see what kind it was so we could order one for ourselves because it was so comfortable! My husband NEVER sleeps in, and we weren’t up until about ten every morning. He gave credit to the bed being so comfortable. During our stay we ate the Hard Rock Cafe, some of the small restaurants on the way to gatlinburg, and grilled out at our cabin. We drove through the Smoky Mountains to Cherokee, North Carolina, where we did some gambling at Harrah’s casino. The view on the way through the mountains was beautiful! We went to Pigeon Forge and checked out some of the sites and visited an indoor zoo while we were there. In gatlinburg, we went to Ripley’s aquarium. We also visited a small ice cream/candy shop almost daily. I can’t remember the name of it, but it was about halfway between our resort and Gatlinburg, next to the Woodworker’s store. The owner was really nice and the ice cream was really good! We also ordered pizza from the pizza place down the road. It was good! Other than that, we stayed in the cabin for a lot of relaxation. Our favorite time was probably the time that we spent in the cabin. It was so nice to just be able to relax with nothing to do and to not be on a schedule. My favorite place that I ate was the Hard Rock Cafe. For our next visit, I would love to do more site seeing! My whole goal on our visit was to see a bear, and I never did. I am hoping next time we will get out more so that I will actually be able to see one! I am thinking the place that we were told (by the owner of the ice cream/candy store) to drive through was Cade’s Cove, and to drive through either at dawn or dusk to see a bear. We never made it, but I would like to do that next time. I’m not sure what the ‘off season’ would be, but I would probably visit when there wasn’t a big event going on. We were there over the fourth, which is during the midnight parade, and it was very crowded. I think I would rather visit when it wasn’t so busy. There wouldn’t be as long of a wait for some of the things that we wanted to see, but didn’t because the lines were too long. We never thought that escaping to the outdoors would be as reviving and relaxing as our honeymoon to the Great Smoky Mountains with Elk Springs Resort! The long drive from Chatham, Ontario Canada was well worth the wait to see our Gatlinburg cabin and spend five nights! We opened the doors of ‘Cowboy Way’ to see a lovely, wooden retreat. Each room is decorated to the theme of the cabin and there were many cowboy, western d?cor surrounding the walls of our escape. After exploring the cabin, we started to unpack and get settled in for our first time stay! We over packed supplies for sure, because the kitchen was supplied with everything we needed! It was a home away from home for sure! We were grateful for the nearby grocery store to quickly grab what we needed for our stay and midnight cravings! 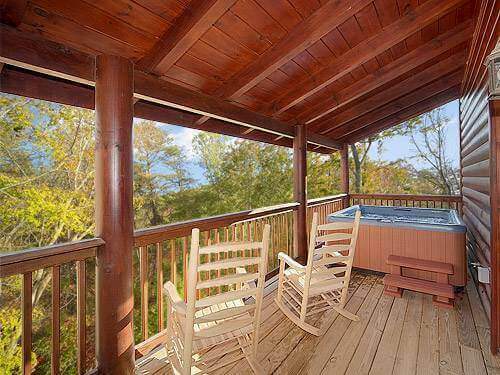 The jacuzzi , and hot-tub were used every night after long days of hiking, shopping and Dollywood! The huge screen T.V. was a favorite by far for my husband to watch movies on a rainy afternoon too! Our honeymoon began with visiting the local arts and craft community shops and talking to many friendly locals that gave us tips to even enjoy our honeymoon more! We found them more enjoyable to shop from because we knew we were helping the families and we enjoyed their products more! By far, our favorite attraction was Ripley’s Aquarium and spent hours enjoying all the ocean wildlife that was there and because of the ticket deal we bought online, we visited the Titanic museum the following day for another enjoyable attraction! Overall, the weather in May was gorgeous and the rain didn’t dampen our spirits as we cuddled up in the cabin and took in our surroundings. We have never visited Elk Springs Resort before and when I signed up to Groupon.com, I noticed the getaway. I thought to myself that we were tired of the beach/resort thing, so I clicked on the fabulous view from one of their cabins and bought the Groupon coupon right away! We even added an extra night and we were so glad we did for all the things to experience there! We hope to visit Elk Springs Resort again, and hope that they take part in a Groupon again to make it affordable for couples that come from long distances. We hope to stay two weeks on our future visit, and next time we’ll do more relaxing and hiking because it is truly God’s country down there and have never felt so free and close to nature when seeing the hills! Thanks again for making our honeymoon a getaway we?ll never forget! If anyone wants to relax and forget about it all, then Elk Springs Resort is above them all! My husband and I are from Winnsboro,SC and we love vacationing at Elk Springs Resort. Some of the cabins that we have had the pleasure of staying in are The Amazing Views Retreat, Cowboy Way, Serenity Lodge, and the Lumberjack Lodge. Most of our stays were between 3-5 days and boy were they the best 3 to 5 days!! I can remember a time we came and it was snowing. It was so beautiful and cozy. The atmosphere was to die, enjoying a romantic dinner by the fire with your loved one and during the day watching a movie in our theater room with friends. At other visits we would enjoy dinners we cooked up with friends and family or even cook out on gas grill on the patio. Not to forget the outside Jacuzzi we all enjoyed. If I had to pick our most favorite thing to do when we are there I would have to say cooking up some popcorn enjoying a movie and later that night playing some crazy games of pool. We found out about Elk Spring Resort in Gatlinburg through a mutual friend that said this was a must see place. They told us it would only take one trip to sell us for life on vacationing there every year and I promise you after that first visit we were sold. 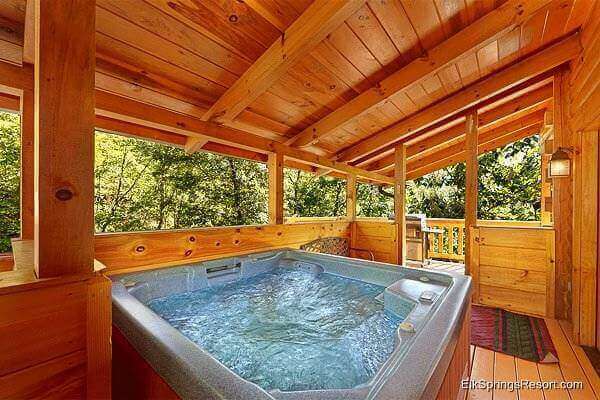 Elk Springs Resort Gatlinburg cabin rentals is a place of fun, relaxation and luxury to accommodate all needs. The staff goes out of their way to make sure not to mention owners goes out of their way to make sure that this is your home away from home. We had so much fun in the mountains and I strongly recommend this spot as your next getaway spot. Thanks Elk Springs for a wonderful stay. See you guys in June 2012. My family (husband, son, and in-laws) traveled from Kansas City, MO. We stayed in the Hilltop Hideaway in mid May 2012 for four nights. There was a really great deal for Elk Springs Resort that I found on Groupon. We have been to Colorado several times and decided to try something new. I spent months looking at the cabin pictures online, so excited. When we arrived at the cabin we were all defiantly happy. When vacationing with a 2 year old on board the HUGE house was just what we needed. He went from one floor to the next and over again. The house was very clean, decorated nicely, and just a really nice place to relax and enjoy. The view is amazing, although most of the time it was pretty cloudy it didn’t take away from the amazing views. Having a full kitchen is very nice for family breakfast before spending the day hiking, white water rafting, zip lining, or just walking around Gatlinburg. At night we either ate at one of the local restaurants (Buba Gump Shrimp and the Mellow Mushroom are both great!) or picked up some steaks and grilled out on the deck while my son played catch with his soccer ball. After a long day shopping and hiking it was very nice to sit out on the deck in the hot tub and relax. There isn’t much more I could ask for on this trip. We all had a great time with family, seeing new sites and doing new things. I think we would defiantly go back to Elk Springs, they have a lot of cabins big and smaller that make for a great vacation. There is a lot to do rather it is adventure or simple shopping, they have tons of fun little shops from art to wood work. My son loved the pool table at the house and it kept him very happy for most of the time. He literally would wake up and want to run up the stairs to go play. We made some really great memories. My family and I are from Mobile Alabama. We vacationed at the Elk Springs Resort in April 2012. We’ve always wanted to take a vacation like this, but I really was not sure about where to find great cabins. After I began asking co-workers, friends, and family for recommendations, the name Elk Springs Resort came up repeatedly. When I looked up the website, I was impressed with the helpfulness of being able to take virtual online tours of the cabins inside and out. The website was very helpful in allowing you to book all the accommodations and amenities you need in a cabin. That helpful feature and the fact that the resort came so highly recommended from family and friends made the choice to stay at Elk Springs Resort very easy. I love the fact that the resort e-mailed our family very specific directions to our cabin because GPS systems sometime fail when you are in the mountains (ours did). I love the fact that the resort called my cell phone to give us our cabin access code at 11:00 in the morning. We were still a couple hours away traveling on the highway, but, had we been in Gatlinburg already, the early access would have been greatly appreciated. During our vacation we stayed in the beautiful SIGHT SEER Gatlinburg cabin. The name of the cabin says it all. It was the most incredible mountain view we could have ever dreamed. The cabin was absolutely gorgeous. The kitchen was full stocked with every convenience just like at home. All the appliances were modern and attractive. The bedrooms and bathrooms were beautifully decorated. And the peace and quiet was blissful. Our cabin offered everyone in our family something special. My husband enjoyed the beautiful view and comfortable seating area on the porch and deck to enjoy morning coffee while watching the sunrise and a cold beverage to watch the sun set every evening. I thoroughly enjoyed the jacuzzi on the deck with the privacy petition. It was so relaxing to unwind while drinking a glass of champagne. My teen aged daughter loved the view from her bedroom and was very pleased with the fact that we had our own router for excellent internet service. The satellite dish let us all enjoy our favorite TV shows. 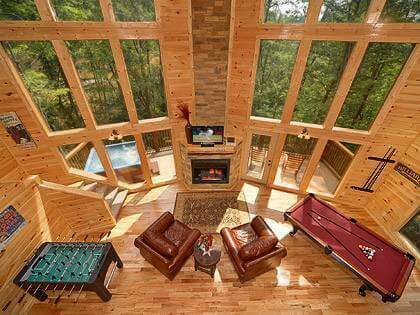 We all enjoyed the game room and pool table. The view from the big bay windows in the game room was awesome. We all loved the location of the cabin. We were less than five minutes away from the grocery store, video rentals, discount store, and restaurants. Our cabin was located in the Arts and Crafts community just minutes from downtown Gatlinburg, so we spent a lot of time browsing and window shopping the local craft stores shopping for homemade goods. We visited the game arcades and museums in Pigeon Forge. We visited the shops and restaurants in downtown Gatlinburg, and we did a little sight-seeing in between. We saw a small bear on our first day driving to our cabin. That was very exciting. We can’t wait to visit again. Next time my daughter wants to try zip-lining and indoor sky diving. And next time, we will all definitely stay a lot longer !!!!!!! Our first stay was for our 1st wedding anniversary in November 2009. We were so impressed with the quality of the cabin and surrounding area we booked the cabin again for our most recent trip to the Smokies. We stayed for three nights to celebrate our wedding anniversary and see the fall colors but wanted to stay longer. Unfortunately, commitments back home meant we had to make the best of the short time we had for our vacation. My wife discovered Elk Springs Resort as she was searching for cabins in Gatlinburg. We had stayed at a different cabin with another company on our first trip to Gatlinburg in 2008 and wanted something nicer. Based on the pictures and the fact that the cabin has a rain tower shower we booked our trip. We were not disappointed. The pictures you see on Elk Springs website are what you get. We enjoyed the upscale feel and the privacy offered by the surrounding trees. We enjoyed the fact that we could stay connected with the free WI-FI then disconnect by enjoying the hot tub or sitting in front of the fireplace. Our favorite amenity hands down is the rain tower shower. It is truly something you need to see and experience. We loved being able to start the day with a warm, relaxing shower. We had considered trying a different cabin in the resort for our last trip, but the rain tower shower brought us back. When we weren’t enjoying the cabin, we made sure to visit some of our favorite places and explored some new ones. Since the weather was good, we took advantage of some of the hiking trails in the Smokies. This most recent trip marks the first time either of us had seen bears. We were fortunate enough to spot a few cubs playing by the side of the road as we made our way to the roaring fork motor nature trail. I wish I could attach a picture of them but unfortunately due to my operator error the picture never took. Our favorite hike had to be the trail to Abrams Falls. It took us some time to get there but it was truly worth it. It doesn’t get more relaxing than sitting on the rocks next to the waterfall. This is a hike we would recommend to everyone. One activity we made sure to do was revisit the same place where we played mini-golf on our honeymoon in Gatlinburg. My wife would claim she beat me but I let her win. 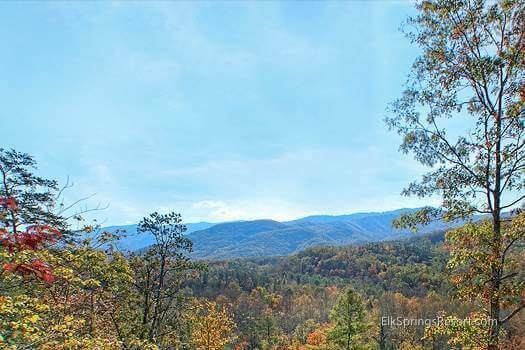 We would highly recommend Elk Springs Resort to anyone looking for a great cabin that is convenient to downtown Gatlinburg but away from the heaviest traffic. We love the fact that it is close to all our favorite places including Santa’s Claus-et in the Arts & Crafts district, Pancake Pantry (don?t get me started on the chocolate chip pancakes), and Ogle’s Brick Oven Pizza and Pasta. Our advice to future visitors ? you can’t go wrong with Elk Springs Resorts. We would consider trying another one of their cabins but that rain tower shower keeps calling us back. We are sure that whatever cabin they choose they will enjoy their stay. Thanks for having us. We hope to be back soon. The Sweet Dreams Cabin at Elk Springs Resort is just what we were looking for and had a wonderful visit. This was a short spring break trip we had taken to Gatlinburg in a couple of years between April 4th & 5th. Our family loved the roominess but coziness we experienced in this cabin. We had a great time spending soaking in the hot tub looking over the woods and pretty view of the other cabins located around our cabin. This cabin is spaced out enough that you feel the privacy you are hoping for. The main floor was very private with no view but the bottom floor had a beautiful view of the woods from the covered patio. The bedroom on the main floor had a King bed that was wonderful. The bottom floor had a rustic queen bed that was so pretty. Each bedroom had its own private full bathroom. We love playing pool and foosball on our down time. 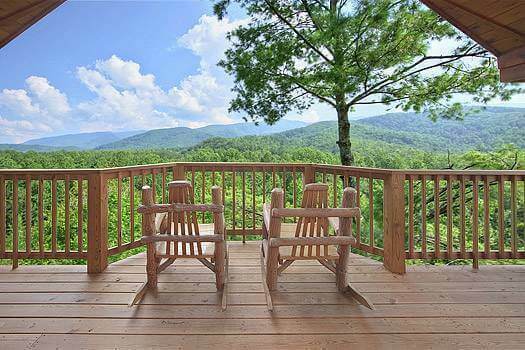 We had gotten up in the morning with a nice cup of coffee and set in the rocking chairs placed on the back patio. We were hoping to see bears on this trip but didn’t get to experience this in our trip. We also took a walk in the morning around the Elk Springs Resort property to get some exercise and look and the other properties and dream of coming back to stay in other cabins. I was very happy to find this Resort due to scheduling late and just finding the resort on the internet. We had gotten this cabin at an exceptional value for a 2 bedroom and would love to come back anytime. If you are looking for a cabin that is beautiful, clean and a great value this in your cabin. This resort is about a 10 minute drive into Gatlinburg that was no problem. There are several stores with a grocery store on your drive to the cabin if you need something to fix on the grill located off the kitchen on the patio just for the grill. We recently visited Elk Springs Resort and stayed for a 7 days in the Silvercreek cabin for my mother and fathers wedding. This was the first vacation that my parents, my family of 5, and my sisters family of 5 went on together. We wanted to stay in a relaxing environment where the kids could run and play together and the adults could get some much needed R & R.
This was our first visit to Elk Springs Resort and we will be back! The cabin was top notch, clean, and comfortable. We could cook for our family. There were plenty of bathrooms for our crowd. Not to mention the relaxing that we did rocking on the rocking chairs on the deck. The children loved the hot tub and having three levels (one for each family) gave us time to spend apart when we needed that as well. We enjoyed being away from downtown Gatlinburg, but close enough to be able to drive each day if we wanted. We all were able to visit the aquarium and some members of our party caught a Smokies Baseball Game, while others visited the go cart tracks and outlets nearby. It was also super nice not having to have a key to keep up with for each family! My parents, after being divorced for many years, reunited in marriage at the cabin where a local minister came to the cabin to perform the service. We had an extra special meal this evening of prime rib, that my husband was able to prepare for the entire family. This saved us lots money and gave us time that we were able to enjoy my parents reunion. The biggest area of improvement that we noticed where an upgrade to the TV’s is needed and the trash (although we called several times for pickup) needs to be picked up more often. Overall, we loved our stay. We will be back. The biggest decision will be if we stay in Silvercreek (which we know we love) or try one of your other cabins which looked just as fantastic from the outside as Silvercreek did! Thank you so much for having our family at your resort. The biggest advice that I can give future visitors is do not plan on arriving after dark. We made one wrong turn and wound up driving up a mountain that terrified us as it was in the middle of no where and there was no cell phone service. We now know not to make that mistake! *** Management Comment: Please call us for trash pick ups as we do have maintenance staff on site. We do suggest following the directions we send with our reservation confirmations and pre-check ins. It is easy to get to our property, but wrong turns can be made. Strongly suggest you follow the directions we send you as they are suitable for day or for night travel. Our family always loves getting away to Gatlinburg, but our most recent trip was for adults only. We were visitors at the Cherokee Charm Cabin in the Elk Springs resort for a couples weekend getaway. We had three couples that met up for the weekend and it was absolutely wonderful. I was very pleased with the professionalism with the staff at Elk Springs Resort when making my reservations, but there can be extended wait period on the phone. However, I do understand the wait period, because everyone is trying to make reservations here! We arrived at Elk Springs Resort, the directions to the cabin were very helpful and upon arrival to the cabin we were in awe. We looked like kids running from room to room and checking out all of the amenities. We really loved that our cabin at balconies on every level (3 levels). And the bedrooms were separated on the different floors as well. 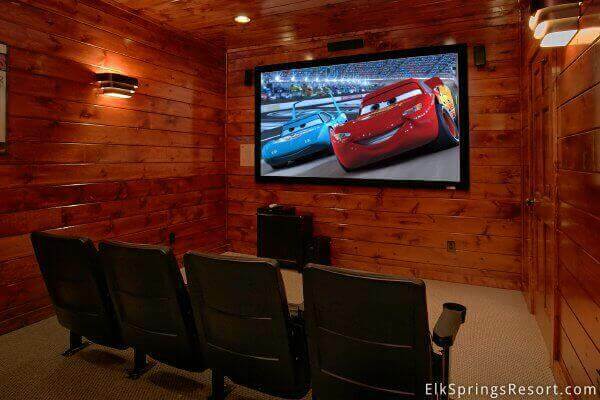 We definitely took advantage of the theater room, which now my husband is determined to have one at our house. I would recommend bringing some of your favorite movies from home because there are not any provided in the cabin. We visited the local grocery store which had a movie rental store inside and was able to create an account there to rent a few movies. We also enjoyed the gas grill that was provided as we tried to stay in for meals. We were able to make a pretty large breakfast, however I would recommend to Elk Springs that a few more baking dishes be provided. The hot tub was also nice and relaxing on the chilly evenings to rest our feet. The bathrooms were amazing, and I have never seen a shower head in the middle of the bath tub; very very unique. My only real complaint was that the house phone, which included free long distance, would not work for longer than about 3 minutes. Again we had three couples, all with children at home and was unable to call and check on them without reducing the conversation to three minutes or to find a local outside of the Cabin where we had cell phone service. We loved that it was a very short drive to downtown Gatlinburg. Everyday we made the short drive to Gatlinburg and walked around to all of the neat little shops. Since we did not have any of our children with us we did not go to any of the Activity stores, but more of the adult targeted stores. My husbands favorite place was the Smoky Mountain Brewery. He was able to stock up on the flavored moonshine for himself and some friends. I enjoyed the taste testing at the Brewery! The main thing that I wanted to do was ride the Gatlinburg ski lift. Normally I am traveling with two small children so it has not looked very appealing, but with me and my husband only it looked kind of romantic, being able to ride up the mountain and enjoy the beautiful views. Normally when visiting Gatlinburg we make sure to drive through Cades Cove but on such a short trip we did not was to take up a whole lot of time just driving, so I was not able to see a bear, which I always itching to see in Gatlinburg. We will definitely be visiting Elk Springs again in the future! 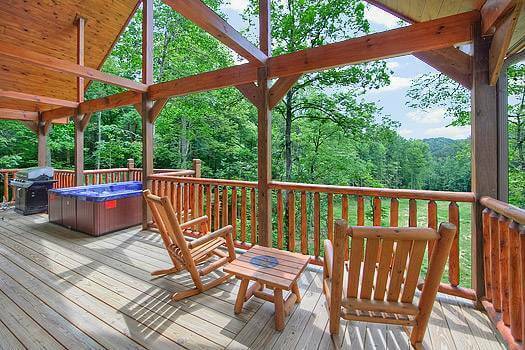 We rented the Finders Keepers cabin for our Gatlinburg vacation. We stayed at the cabin for six days. This was my first trip to the Gatlinburg area. My daughter came up with the idea that we do a family vacation. She also thought it was a great idea that I pay for the cabin as a Christmas present for my two children, their spouses and grandchildren! I was excited at the thought of my family spending quality time together under one roof. My daughter took charge of looking for the cabin that would satisfy all of our family’s needs. It took about two weeks to find the cabin that we thought would be perfect for us. We made our final decision based on the reviews we read about Elk Springs Resort. The cabin was everything that we expected or hoped for. My son and his wife have two boys ages 7 and 15 years old. We put his family on the top floor. It had a pool table, air hockey table and a theater room and large master bedroom. Our thought process was that if they were up till 2am playing it would not affect our sleep. The middle floor was the kitchen and living area. We picked this lay out because our thought process was then we had a buffer to help keep the noise level at a minimum. The remaining three bedrooms were located on the bottom floor. My daughter and her husband have a 2 year old boy and wanted to make sure he was not disturbed during the night. He slept peacefully throughout the night. We cooked at the cabin and were very satisfied with the kitchen. It was stocked with an adequate supply of cooking and eating utensils. During our stay my daughter celebrated her 27th birthday. Her husband cooked steaks on the outdoor grill that night. The grill was in great shape and was very clean. I personally did not use the Jacuzzi but my older grandsons did and enjoyed it. The cabin was very clean and the beds were comfortable. During our stay we went to Cades Cove. We were so excited because we saw a bear cub and its mother (Kodak Moment). We also hiked and climbed the trail to Laurel Falls (paved trail). My family also hiked to Abram falls. The trail is more difficult (rocky/dirt) and is 5 miles round trip. Make sure you have water and plenty of time to rest along the way. When we were not enjoying everything nature has to offer we were checking out the attractions in the area. My only regret was that I did not have enough time to visit everywhere I wanted to go. I plan on going to the Hatfield & McCoy Dinner Show in Pigeon Forge when we return. We saved the tour of downtown Gatlinburg for Saturday. We were not aware that they were holding a Santa parade that day. It was the highlight of our two year old grandson’s vacation (along with climbing up and down the stairs in the cabin)! The location of the cabin was perfect and I cannot speak highly enough of the cabin we stayed in. We are already talking about returning to Gatlinburg and will defiantly be booking with Elk Springs Resort on our next vacation. SEE YOU SOON!! My husband and I rented a 1 bedroom cabin ‘Tree Tops’ and this was one of the best vacations we had ever taken. We were visiting for our Anniversary and to experience the Smoky Mt. Park area. The views from our deck were so beautiful and relaxing. The reason we chose this cabin was the amenities; view, hot tub, pool table, free wireless internet, flat screen television, washer, dryer, and gas grill. Amazing and clean. We shopped for groceries a few miles away and my husband grilled on the deck every night we were there. It was so cozy. Because we enjoyed the cabin so much, we would take small day trips and come back to the cabin to make dinner. Loved it! We picnicked at the park, took the drive through the artisan’s loop, and drove to Cherokee, N.C. to the casino, such a beautiful drive. What we liked most was relaxing at the cabin, grilling out on the deck every night, and having a hot tub after the long day. It was like coming home every night. We will not stay anywhere else in Gatlinburg. We will be returning to Elk Springs Resort. The staff was wonderful to work with. Actually, we forgot something in our cabin, and when we called them, they said don’t worry about a thing, and within a few days the item was mailed to our home free of charge. If you are looking for a clean, safe, beautiful, area in Tennessee, with excellent service and amenities, then you have to try Elk Springs Resort. You will not be disappointed. Thank You Elk Springs Resort, for your excellent service. We will be back. How did you hear about Elk Springs Resort? I usually check hotels on trip advisor and read so many amazing reviews and made my choice. We would probably try staying at different cabins every year we come, especially since we have told many family members about our stay, and would need more space.Also, would love to drive the Blue Ridge Highway next time. My family and I visited Elk Springs Resort the week of August 8th, 2011. We are a family of four and also brought my mother in law. We chose to stay in ‘Beary Cozy’ due to the value rates for the week and the beautiful pictures. We had stayed at the Resort two years prior with 2 other families at ‘Sweet Dreams’ and enjoyed our stay then as well. We called the resort to see if there were any discounts available for returning customers, the staff was so friendly and willing to help, they offered us a GREAT discount and we booked right away. I immediately started looking for things to do, and their website was such a big help! The community center with the indoor pool and kid pool was definitely on our ‘to do list’, but it ended up being closed that week for maintenance. We planned to visit the aquarium, Titanic Museum, and Ober Gatlinburg. Since Gatlinburg is full of attractions and plenty of shopping, we didn’t get to do everything, but we of course didn’t mind. Since our cabin had a beautiful kitchen we decided to try and save money on eating out and cook 3 out of the 5 nights. The grocery store that is located less than 10 minutes away was wonderful. They had everything we needed and if there was something they didn’t have, the Family dollar located right down the road did. There was also a Dollar General right there as well, but we didn’t have to go there as we found everything at the other two stores. Now there was a couple of mornings where we left out early and didn’t have time to cook breakfast and the McDonalds less than 5 minutes away was perfect for those occasions. 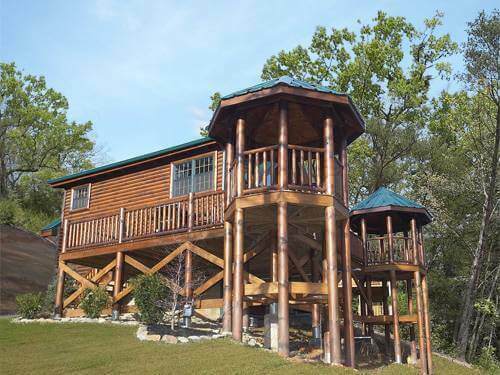 I guess you can see why we are repeat customers of Elk Springs; the cabins are just as pictured and absolutely gorgeous. The staff is friendly and willing to help with any questions you may have, plus offering great discounts. I don’t really have any major complaints regarding the resort, the only thing I would mention and its really no big deal is the close proximity of the cabins. Some are close together, but there are ones that are secluded. Seclusion was not a big deal to us, so we didn’t focus on that aspect to much. Overall, we enjoyed our stay and will be visiting again. First and foremost, I want to thank you for a wonderful, stress free honeymoon weekend! I have never been to Gatlinburg before but my husband has been several times in his past. 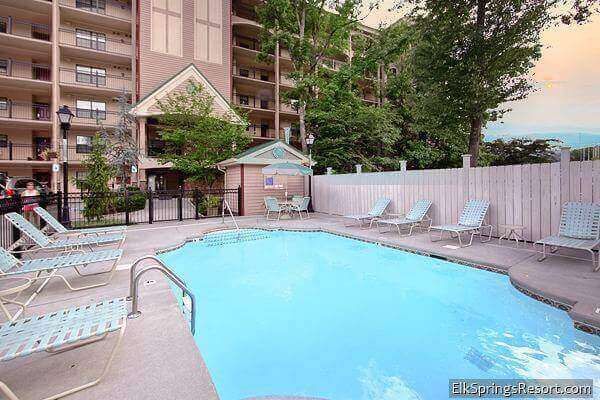 We found this resort by researching online and found that Elk Springs Resort had the best reviews and was voted number one by Gatlinburg visitors. This was not where we intended to have our honeymoon but we sure are glad we did! We visited in the middle of October so the fall scenery was beautiful and definitely a plus. We are from Millbrook Alabama so it did not take us too long to drive to Gatlinburg. We stayed at Snuggled Inn cabin which was very secluded and nestled all by itself. We would have enjoyed more views of the mountains but the peace and privacy was well worth the one vice of this amazing cabin. The cabin was extremely clean and fit the pictures on their website perfectly. It is stored with everything you need throughout your stay. It has a ‘rain shower’ that was really neat and was one of the reasons we booked the specific cabin. We just so happen to book our trip on a ‘vacation weekend’, so it was super busy and took at least an hour to get where we needed to go. This was a big downfall at first but we ended up spending most of our time in the cabin and cooking in. We did however, get to see the new Titanic museum and aquarium, which both were very fun. The biggest let down ended up being the best time we had there! We were able to spend our entire honeymoon in an amazing cabin and by the end of our stay we didn’t want to leave! 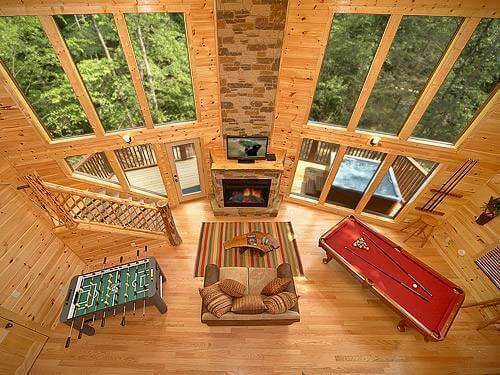 This cabin ended up being awesome! When we started planning our family vacation this summer of 2011, we decided that we needed to relax a bit, due to our very busy schedules. We started thinking about where we could go to have some family fun, and also quiet time. We are from Chesterfield, Michigan, which is a northern suburb of Detroit. We did not want to go to a busy beach resort or amusement park, but we did want to make sure our 9 year old daughter was entertained. We thought about the Smoky Mountains, as we had never been there. We started doing some internet research, and that’s how we found Elk Springs Resort. There were so many great reviews, including top ratings on Trip Advisor. Once we called and spoke to the staff, we knew this was the right place for us. We saw beautiful cabins in the mountains, fun things to do in the cabins, fun stuff to do around town, and enough seclusion for us to have our down time. We selected Summit Sanctuary as the right cabin for us. It was hard to decide, as each of them seemed wonderful, but we knew we had to pick one. 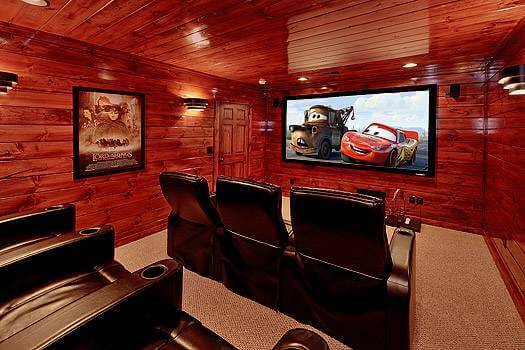 This cabin ended up being awesome! We stayed for 7 days, and it was such a great vacation. My daughter was jumping up and down when we walked in, and was so happy with her floor. She had bunk beds in her room, the theater room, the sauna, her own bathroom, the game room with Xbox 360, and the hot tub on her deck. On the main floor was the very equipped kitchen, dining area, great room with flat screen, bedroom, bathroom, and the grill on the deck. The top floor had the master suite, as well as the pool table and another deck. The cabin suited us beyond our expectations. 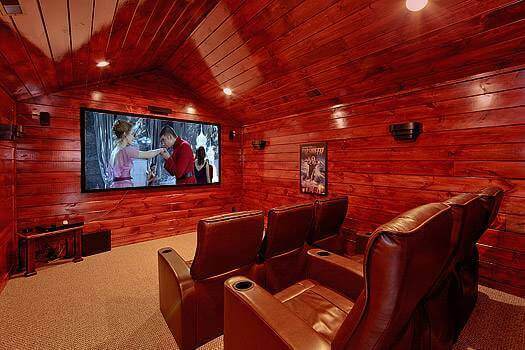 We loved watching movies in the theater room! We made popcorn and snuggled in. We also played many games of pool, as well as card games around the table, and relaxed in the hot tub. We cooked most of our dinners there, leaving more in the budget for outings. The market nearby was perfect for groceries, as well as movie and game rental. Our outings included horseback riding in the National Park, whitewater rafting, Dollywood, Ober Gatlinburg, downtown Gatlinburg and Pigeon Forge, and much more. We think our favorite outing was either whitewater rafting or horseback riding, but it was hard to decide! When we return, we will definitely stay at Elk Springs Resort again. The location was perfect in the Arts and Crafts area, and we did some shopping there. I would definitely recommend this resort to anybody planning on visiting the area. There are plenty of cabins to choose from to suit your needs, and the staff is very helpful. Make sure to bring cards or board games, because once you get there, you will want to spend time at the cabin. No One Wanted To Leave The Cabin! My husband, son and I are from Indianapolis, Indiana and we stayed at Elk Springs Resort last August for five nights. We stayed in the Mountain Fever cabin and all I can say is Oh My Gosh!! It was such a beautiful cabin!! I had searched for days (weeks maybe?) 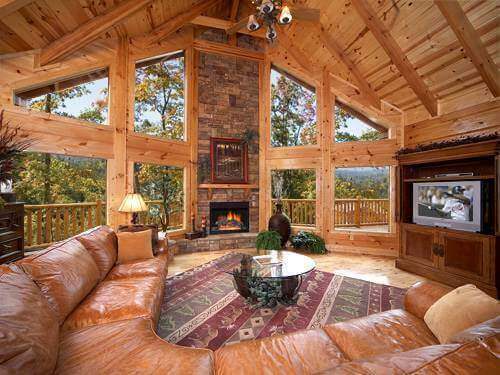 for the perfect cabin for our vacation. This was our first family vacation with my son and I wanted it to be perfect. And thanks to Mountain Fever and Elk Springs, it really was. I had a long list of activities for us to do while we were in Gatlinburg but the cabin was so nice that no one wanted to leave! My son is 8 years old and I was worried about him not sleeping well in a strange room but he was so comfortable in his own room with bunk beds that sleeping and staying in bed was not a problem. Of all the things to see and do in Gatlinburg, his favorite part of the vacation was staying in the cabin. He loved the bunk beds, the hot tub, the theater room, the big bath tubs. 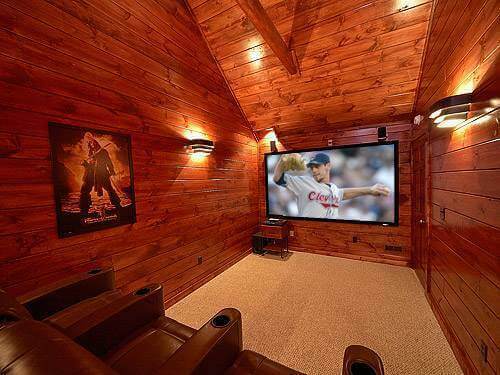 My husband’s favorite part of the cabin was definitely the theater room. It was not something we were looking for in a cabin, but once we were there and experienced it we fell in love. The reclining chairs were so comfortable and the sound and picture quality were just like being at the movies. He also enjoyed cooking out on the gas grill and relaxing on one of the three decks. I have so many wonderful things to say about this cabin as well. First off, it was CLEAN! Even outside on the decks was spotless! The kitchen had everything we needed and everything worked well. It was an easy kitchen to cook in. The bathrooms were beautiful as well. While we were there we did have an issue with the lights not working in the kitchen and living room area. I called the office and since it was after hours I had to leave a message. Within five minutes I received a return phone call and less then ten minutes after that we had someone at the cabin and he immediately fixed the problem. The staff at Elk Springs was so nice and we received excellent customer service. I was able to drag my son and husband out of the cabin a few times and a couple of our favorite things were Ripley’s Aquarium which was awesome, the Old Mill Restaurant which was delicious, and hiking around the park. It was a great vacation and we will have wonderful memories of it for years to come. Thank you Elk Springs for an awesome vacation! After a visit to ‘Grin and Bear It’ in June, my husband and I knew that we must return before the summer was over. We booked ‘Cowboy Way’ for a week of relaxation August 6-13, 2011. We were confident in our decision to stay at Elk Springs Resort, because we had very much enjoyed our first and second visits. Although we had stayed in ‘Grin and Bear It’ twice, my husband and I were looking forward to watching movies on the nine-foot projection screen in the theater room in ‘Cowboy Way’. Additionally, we loved that we could bring our four-legged child along to stay in a pet-friendly cabin! I was concerned that with the cabin being pet friendly, we might be disappointed in the cleanliness compared to our previous visits. The cabin was just as clean as the others. Also, it was in a great location with easy access and parking. We all enjoyed preparing our meals in the well-equipped kitchen and grilling dinner on the deck each evening. The wrap-around deck was the perfect place for enjoying peace and quiet and soaking up the sun. With cabins in sight, it is remarkable how quiet the resort is. One afternoon, we were excited to see a black bear pass behind our cabin and cross the main road within the resort! It was a nice reminder that we truly were enjoying a week in the mountains! My parents travelled from West Virginia to stay with us. It is a much longer drive for them, but they love Elk Springs Resort as much as we do. We stopped at the Smoky National Park Visitor’s Center and picked up a few driving guides for the area. A friendly park representative told us that early morning was the best time to see animals roaming in Cade’s Cove. The next morning we left the cabin before daylight (thank goodness for the coffee pot in the kitchen!) to drive to Cade’s Cove. Not long after we arrived, we spotted two black bears eating and playing in the low branches of a tree along the road. We took many pictures of the animals, beautiful mountain views, and historic buildings. I highly recommend the Roaring Fork Loop drive and encourage you to ride with the windows open if the weather permits. The smells and sounds of the fresh water running down the mountains, and the sounds of birds throughout the woods are quite refreshing! We learned the history of the park and the settlers who lived there before the park was created. We purchased a tour pamphlet from the Visitor’s Center which explained many details we would have otherwise missed. We hiked to Grotto Falls from Roaring Fork. The hike was a two-mile stretch mostly uphill on the way to the falls. The temperature was much cooler there, and the view of three falls cascading through the wooded area was beautiful. While we enjoyed touring the National Park, visiting local shops in the arts and crafts community (Alewine Pottery and Apple Annie’s are my favorites! ), and a little shopping at the Tanger Outlets in Sevierville, we truly enjoyed spending time in our cabin. The resort is perfect for walking in the evenings, and admiring beautiful sunsets. After our hike to Grotto Falls, the hot tub was perfect for relaxing and winding down. The best part of our vacation was enjoying time together. We are grateful for such a comfortable place to gather, and we look forward to bringing other friends and family for future visits. A vacation? We hadn’t really thought about it ? it was March, after all. And then our daughter and her family have invited us to join them on theirs. They had been looking for a place to go with the family and after some research, determined that they were going to the Great Smokey Mountains, and had rented a ‘cabin’ that had plenty of room for their family and the two of us. What fun time with the family and the grandchildren and we hadn’t been to Tennessee, either. So, the planning began. Departure was scheduled for the end of May. What should we do, where should we go, and oh, by the way, here’s the website for where we’ll be staying. It’s called Elk Springs Resort. Cabin? Did you say cabin? Nothing could have prepared us for what we were viewing on the web. The beauty of the area, the incredible views, the size and amenities of the ‘cabin’ quite literally took our breath away. Our arrival at the Four Seasons came after having spent the previous week in a hospital room with a beloved family member. We were ready to unwind and relax. I wish someone had been there when we pulled up to the cabin to record the expressions on our faces as we drove up, entered and explored this incredible edifice. Beautifully decorated, with every possible convenience we could hope for, yet not pretentious. It was a perfect environment for 2 families to share, giving us both private and community areas. They stayed on the lower level; we took the upper ? which provided us with all the amenities of having our own home away from home, while still being all together. We loved sitting out on the rear decks on the upper and main levels, reading, talking, and enjoying God?s beautiful creation. Sadly, we were called back to our original destination after just 2 and 1/2 days, and had to leave this beautiful place, but we both were convinced that we definitely wanted to return to Elk Springs again. This place had indeed touched us in a tangible way. Fast forward to September?.God provided the means to take (another) vacation. We’d spend 3 weeks on the road, culminating with a week at Elk Springs, where we’d unwind and relax and enjoy the sights. This time, it was just the two of us, and we stayed at Elk Springs? Bearfoot Mountain Resort in the Unforgettable cabin, and we definitely were not disappointed. Once again, we entered with many oohs and aahs! This cabin was more than perfect for just the two of us. The weather was incredible and we spent many hours on the rear deck ? reading, relaxing and dining; in the hot tub, and enjoying that fabulous 55′ 3D TV. Our time in our little mountain paradise passed much too quickly, but the memories will linger on and we know that if the Lord wills, we will definitely return to Elk Springs. Our heartfelt thanks to God who allowed us to take this trip and granted us safe travel. To all those at Elk Springs who (patiently and so pleasantly) answered all our questions, and to those who created this wonderful resort area for people to enjoy, we thank you. Our time was so blessed. I am confident that anyone looking for an amazing vacation experience can confidently enter into a commitment to stay at Elk Springs. The variety of things to do is endless, as is the joy found simply in the quiet rest that will be found here. I just wanted you to know what a difference you made in our family. We have 2 and 4 year-old biological children, and 13 and 15 year-old foster children. The big boys have been through so much lately, and it breaks my heart. Although we didn’t really have it in the budget to come, we wanted to do something to make them feel special, loved, and wanted again. The cabin at Elk Springs Resort was great! We were able to forget about all the craziness going on at home and just spend time together. Something as simple as providing the XBOX 360 for them made all the difference in the world. They were so excited to be able to play into the wee hours of the night and just be kids again. We left feeling very close, connected, and blessed! Thanks for making that happen! As soon as we save up some money, we will be back. It is amazing what some time away and nature can do for a broken spirit!